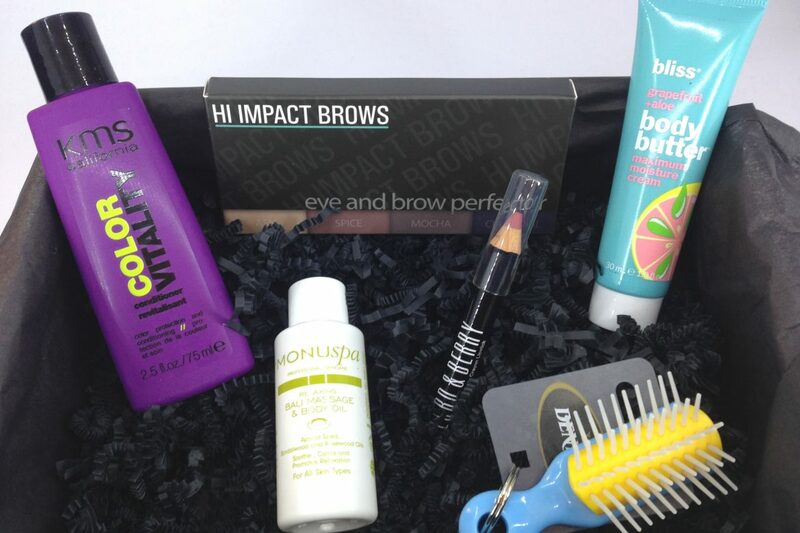 My favourite day of the month is receiving my Look Fantastic box. I’m still in the honeymoon period of loving everything I receive in it. Once again a great mix of products and three ‘full size’ products! This month’s box was the #lfloves edition and I can totally see why. First up is this month’s skincare choices Monuspa Massage & Body Oil and Bliss Body Butter. You may think after my last brush with Bliss I’d be reluctant to try the body butter but actually this stuff is amazing. It’s probably the best body moisturiser I’ve tried in a while. For a start it smells amazing without being hideously overpowering and it really does moisturise well without being at all greasy. It was a joy to use this for a few days. I say a few days because a little does not go along way with this product. This tube lasted around 4 days I believe which by my calculations means the full size at £22 would last me around a month. I actually don’t think that’s too bad in terms of value so I would definitely purchase. I also really like the Monuspa oil. Once again the smell is amazing and it really does transport you to a spa making this a great product for recreating that spa feeling at home (if you have a willing masseuse, that is). If not, this is still a nice body oil to use just for general moisturising. It’s not overly greasy but does leave your skin feeling soft and smooth. The full size of this is £26 though, so unless you’re using this for massages, I would recommend the Bliss instead. This month’s make up made me pretty happy too. The Hi Impact Brows Pallette was perfectly timed as I’m desperately trying to do something with my sparse horrible brows. The Lord & Berry Matte Lip Crayon was initially less exciting. I’m scared of matte lips and never thought in a million years that it would suit me or my small, poorly maintained lips. Oh how wrong I was. This stuff is amazing. It’s so good that after turning up to work once wearing it a colleague bought three different colours and a male colleague actually complimented me on my make up. That never happens. It’s also the most long lasting product I’ve ever worn on my lips. I applied it first thing in the morning before work and after a full morning of drinking and eating, there was still colour after lunch. Not full colour, it had obviously faded but it’s a great low maintenance product perfect for work or long days. This is priced at £10 which I’d quite happily pay although I’m not sure I’d want any of the other colours available, they seem a little bright for me. The brow kit I’ve only played with once but I like it so far. I’ve never really used eyebrow powder with any success before so I’ll need to practice before I confidently use this before leaving the house! It’s really quite easy to use and the powder is soft and so easy to blend out if you make a mistake. It does claim to be anti smudge and waterproof though I can’t really comment on that yet. At £15.99 to buy it’s technically worth more than I actually pay for my box each month, which is awesome value. Finally the haircare in this month’s very well balanced box with KMS Color Vitality Conditioner and a Denman mini keyring brush. The conditioner I haven’t used yet as my current colour is past the point of help. From previous experience with KMS though I’m looking forward to using it when I finally get around to colouring my hair next as they’re nice products and the ones that my hairdresser uses. The keyring brush I honestly thought was going to be useless. I’ve got fairly long, knotty hair and thought this would be too small to be of use but I was oh so wrong. For on the go this little brush is brilliant. Yes it does sometimes struggle with my knotty hair but it’s a great little size and doesn’t take up a lot of room in a night out bag. This is now a firm fixture in my little handbag. It’s also only £2.50 so it’s a bargain too. I really can’t recommend this box highly enough. They don’t seem to do one off boxes which I know can put off some people but I just have a recurring three month subscription which works out at £13.33 a box which for what I receive each month I find amazing value. This is now my only beauty subscription and I’m happy with that – it keeps me in great make up and skincare each month!